Craftsman has been in trouble for a number of years, I think mostly due to the fact that Sears itself has been having problems. 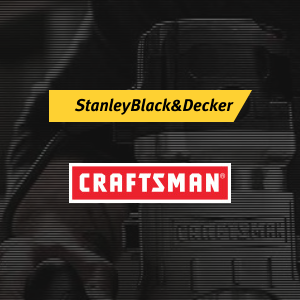 Today, though, Stanley Black & Decker completed their purchase of the Craftsman brand from Sears Holdings Corporation, and Craftsman will have a second chance as a maker of American tools. There are a number of reasons why the once king of American-made hand tools fell from its throne, like the decline of brick and mortar shopping or the fact that they were making tools in china, but hopefully, that is all behind us now. Now it is time to look forward at what Stanley B & D can and should do with the brand. With Sears Kmart, the Craftsman brand was limited to being sold at only Sears, Kmart, and a select few other stores. This is going to change quickly. S B & D has said that they are "working immediately to make Craftsman products available to more people than ever before". This means there is a good chance that Craftsman will be sold at more stores like The Home Depot or Lowe's and more online retailers like Amazon. Will Craftsman be Made in the USA? One of the things that put me off of Craftsman in recent years was their move to produce more tools overseas. I can buy any tool from China, but Craftsman has been synonymous with the affordable US-made tools and the idea of anything else is unacceptable for me. Will Craftsman be Made in the USA? Yes. This is a quote directly from the press release, "Stanley Black & Decker will focus on U.S. manufacturing, using global materials, with the confidence that this will grow the Craftsman brand." The hand tools might not be made with American steel, but at least they are made in American factories. S B & D already manufacturers a number of DeWalt Cordless Tools in the USA using global materials, so they have some experience with the logistics. It is possible Craftsman tools will be made in the same facilities as these DeWalt tools. Will Craftsman be sold at Sears? Yes. We can expect to see Craftsman tools sold at Sears stores. It would almost be a crime to walk into a Sears and not see aisles of Craftsman tools. Besides, how else is Sears going to get Men into their stores? Will the Craftsman warranty stay the same? Yes. Craftsman branded products will continue to be covered under their existing warranties. On Day 1, there are no changes to how an end user gets service or how a non-Sears authorized retail associate would operate regarding the warranty. Customers can call 888-331-4569 or visit https://www.craftsman.com/customer-care/warranty-information. Bring the name back to its former glory. Stop making cheap tools just because you can. I know Craftsman has always been targeted towards DIY'ers, whether working on their own cars or their own homes, but that doesn't mean these people want cheap tools. Many of them would rather own mid-range tools that they can depend on for years to come; this includes outdoor power equipment, and woodworking tools as well.